The Vita Spa Monarque 7 seat hot tub from Bay Spas in Devon. This fantastic hot tub is a perfect solution for customers looking for a family sized hot tub at a great price. 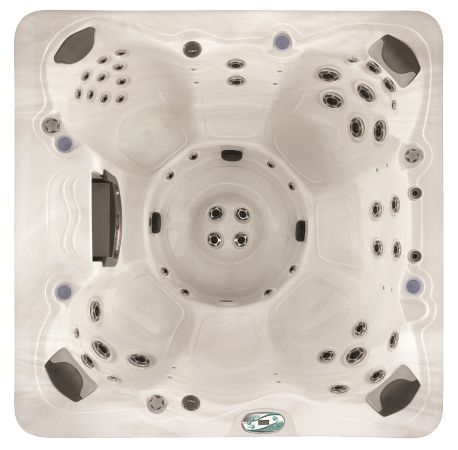 There are 10 air outlets and a total of 52 jets in stainless steel powering through to 4 corner seats and 3 middle seats to provide a large family hot tub with plenty of power. Each corner seat has its own LED cup holder with the programmable control panel beaing easily reached from two of the corner seats. The M7 heating system and the recycled insulationmeans that the running costs for this seven person hot tub are kept to a minimum! One of the major benefits of the Monarque is the foot massage sysrtem. The innovative design means that all users can benefit fromthe high velocity volcano jet plus 4 additionbal jets foot massage system. Built into a stainless steel frame that is lightweight in comparison with the traditional timber frames,, you also benefit from the legendary build quality associated with the Vita Spas range.